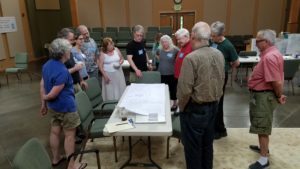 In the fall of 2016, the leadership of two organizations based in the State of Washington began evaluating where they were and where they would like to be. 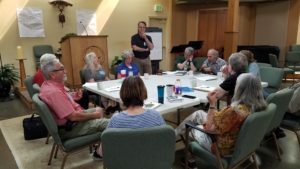 The Northwest UU Justice Network forged pathways between UU individuals and congregations throughout Washington, the Pacific Northwest, and beyond. It tracked and provided leadership, support, and expertise to tackle the challenges in a variety of social and environmental justice issues across congregations, cities, and, as necessary, states, regions, and nations. WA UU Voices for Justice was an organization that focused its efforts and resources on legislative advocacy and lobbying, participating in hearings and organizing action on policy issues on a statewide level. It provided training and informed voices to speak to members of the state legislature. In August of 2017, we met together for a weekend retreat and discovered many things about ourselves, and our organizations. As representatives of 10 different UU congregations, we searched our souls…and we dreamed. We spoke about our strengths and our weaknesses, our abilities and our shortcomings, and we spoke about what we wanted to be when we grow up. We discovered that we shared a common desire to expand, deepen, and strengthen our justice work. We understood that effective justice work means reaching out, gathering in, and uniting our voices, passions, and resources–and then bringing them to bear on the injustices that are besieging humanity at home and abroad in the greater global family. In these challenging times, we recognized that effective justice work is ever more important to the soul of Unitarian Universalism. We all recognized that we cannot do it alone. We also discovered that neither organization alone had adequate resources to achieve our dreams of justice. However, if we combined our passion and resources we could become a formidable force for change. That summer weekend, we came to know that our vision was not just merely that of a merging of our two organizations. We shared a deep awareness that much more was needed to address justice issues of our day and time. We also looked at ourselves and saw the typical makeup of Unitarian Universalists–older, white, and economically advantaged. We knew that we would have to reach out and engage members from historically marginalized communities, youth, young adults, religious professionals, and congregational leaders. We recognized that we needed the strength and wisdom that comes from partnerships with other Unitarian Universalist organizations and other social justice and environmental organizations, interfaith groups and equity-minded individuals within our greater communities. We recognized that without these voices, any justice work we might accomplish would be inadequate to affect real change. We discovered, more importantly, that each of us carried a deep-seated love for justice and equity and a strong underlying calling that cried out “Love is How; Love is Why!” Within that Love, we envisioned a justice organization that would have a further reach into, a more effective voice in, and an increased presence and ability to support UUs working on justice issues and actions in Washington and throughout the Pacific Northwest. And so, here we are as one organization: JUUstice Washington. But we know we still have a long way to go to reach our dream. We’re extending a hand to all of you, hoping you’ll join us on this journey to help create a better world together.